German Chamomile plant, Matricaria recutita, is is the well known Chamomile of fairy tales, commerce and bedtime. A calming tea for gentle bedtime sedation, stomach ache and teething babies. Also used as hair rinse for blondes and as a spray in the garden. 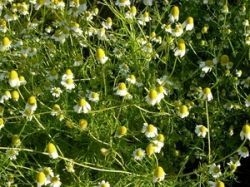 German Chamomile plant is native of Europe and prefers rich, well drained soils in an open sunny position. White and yellow daisy like flowers. Drought and frost resistant. An annual plant growing to 0.45m x 0.5m. Readily self-seeds. Sow from autumn to early spring. Be the first to review “Chamomile, German plant” Click here to cancel reply.